With Fair Start Scotland due to start in April 2018, the Scottish Government has published a report, No One Left Behind, that sets out a series of actions to improve employment support. 'No One Left Behind - Next Steps for the Integration and Alignment of Employability Support in Scotland' contains a series of actions that the Scottish Government will develop and implement collaboratively with their partners, with a specific focus on integrating employability support with health, justice, and housing services. Solihull Council has stated that it intends to close its supported employment service, STEPS. The service currently supports nearly 250 people with 70 in paid jobs. STEPS, pictured, won Care Team of the Year at the council's 2017's Solihull Together Awards and the 8 staff will now be redeployed. Esther McVey has announced that the maximum cap on Access to Work payments will be raised to £57,000 per year. This is a £15,000 rise on the current cap which was introduced in 2015. The new cap will apply to new claimants from April 2018. The new cap will now become double the average annual wage. Channel 4 has produced a pioneering guide to employing disabled people which has been especially tailored for the TV industry. It's been revealed that a record number of Persoanl Independence Payments (PIP) and Employment & Support Allowance (ESA) appeals are now resulting in the overturning of DWP assessment decisions. In the past three months, independent tribunals ruled in favour of claimants in 69% of appeal cases for both benefits. This represents the highest percentage ever for PIP over a three month period. Our 2017 Practitioner of the Year, Carolyn Tucker, is celebrating after winning another prestigious award at the National Autistic Society’s Autism Professional Awards 2018. 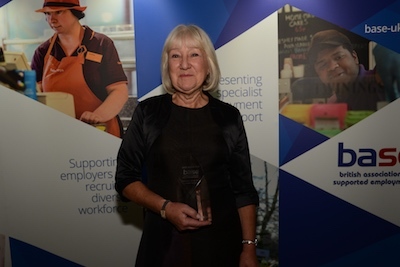 Carolyn, who works for Surrey Choices, was named the winner in the ‘Most Inspirational Social Care Professional’ category. Carolyn impressed the judges with her exceptional contribution to the lives of autistic people. Carolyn supports people with a wide range of disabilities by helping them to find employment opportunities with local employers. The Learning and Work Institute has published an online Employer Toolkit that has a focus on supporting apprentices who have a disability. Together for Short Lives have announced the launch of the second round of the Improving Transitions for Young People Fund. Having awarded funding to two projects in the first round of the funding in 2017, they are again reaching out to children’s and adult services to support their development of innovative services and approaches to overcoming the barriers seriously ill young people face in their move to adulthood, helping them to live life to the full.